apprentice, met Ub Iwerks; with Iwerks briefly in business, doing illustrations and ads; 1920—joined Kansas City Film Ad Co., making cartoon commercials for local businesses; 1922—incorporated Laugh-o-Gram Films, first studio, went bankrupt; 1923—to Hollywood, contract with M. J. Winkler, began Alice in Cartoonland series; soon joined by Iwerks; 1927—ended Alice series, began Oswald the Lucky Rabbit series; salary dispute with Winkler; formed Walt Disney Productions; 1928— Steamboat Willie released, first synchronized sound cartoon, featuring Mickey Mouse; made deal with Pat Powers for independent distribution; 1930—began distributing through Columbia; 1932— Flowers and Trees , first cartoon in Technicolor and first to win an Academy Award; released through United Artists; 1937— Snow White , first feature-length cartoon, marked innovative use of multi-plane camera, developed by Disney Studios; began releasing through RKO; 1941—strike by Disney staff belonging to Cartoonists Guild; Art Babbitt fired, later rehired; changes introduced included credit titles on cartoon shorts; 1944—"Mickey Mouse" is password on D-Day invasion of Europe; 1945—"True Life Adventure" series began, Disney's first live-action films; 1951–60—Disney developed several television programs; 1954—formed Buena Vista Distributing Co. for release of Disneyand occasionally other films; hosting Disneyland TV series (later Walt Disney Presents , Walt Disney's Wonderful World of Color , The Wonderful World of Disney ); 1955—Disneyland opened, Anaheim, California; The Mickey Mouse Club premiered on TV; 1960— Walt Disney's Wonderful World of Color premiered on television; 1971—Walt Disney World opened in Orlando, Florida. Awards: Special Academy Award, 1932; Special Academy Award for contributions to sound, with William Garity and John N.A. Hawkins, 1941; Irving G. Thalberg Award, 1941; Best Director for his work as a whole, Cannes Film Festival, 1953. Died: California, 15 December 1966. Sketch Book , Old Saybrook, CT, 1993. "What I've Learned from Animals," in American Magazine , February 1953. "The Lurking Camera," in Atlantic Monthly (New York), August 1954. "Too Long at the Sugar Bowls: Frances C. Sayers Raps with Disney," in Library Journal (New York), 15 October 1965. Rotha, Paul, Celluloid, the Film Today , New York, 1931. Bardeche, Maurice, and Robert Brasillach, Histoire du Cinéma , Paris, 1935. Field, Robert D., The Art of Walt Disney , New York,1942. Eisenstein, Sergei, Film Sense , translated and edited by Jay Leyda, New York, 1947. Clair, René, Reflections on the Cinema , translated by Vera Traill, London, 1953. Martin, Pete, (ed. ), The Story of Walt Disney , New York, 1957.McGowan, Kenneth, Behind the Screen: The History and Techniques of Motion Pictures , New York, 1965. Kurland, Gerald, Walt Disney: The Master of Animation , New York, 1971. Maltin, Leonard, The Disney Films , New York, 1973, revised edition, 1984. Mosley, Leonard, The Real Walt Disney , London, 1986. Schickel, Richard, The Disney Version: The Life, Times, Art and Commerce of Walt Disney , London, 1986. Culhane, Shamus, Talking Animals and Other People , New York, 1986 + filmo. Taylor, John, Storming the Magic Kingdom , New York, 1987. Grant, John, Encyclopaedia of Walt Disney's Animated Characters , New York, 1987. Thomas, Frank, and Ollie Johnston, Too Funny for Words , New York, 1987. Holliss, Richard, and Brian Sibley, The Disney Studio Story , London, 1988. Duchene, Alain, Walt Disney n'est pas mort! , Paris, 1989. Ford, Barbara, Walt Disney , New York, 1989. Grover, Ron, The Disney Touch , Homewood, Illinois, 1991. Jackson, Kathy Merlock, Walt Disney: A Bio-bibliography , Westport, CT, 1993. Merritt, Russell, Walt in Wonderland: The Silent Films of Walt Disney , Gemona, 1993. Fanning, Jim, Walt Disney , New York, 1994. Smoodkin, Eric, (ed. ), Disney Discourse: Producing the Magic Kingdom , New York, 1994. Thomas, Bob, Walt Disney: An American Original , New York, 1994. West, John G., Jr., The Disney Live-action Productions , Milton, WA, 1994. Eliot, Marc, Walt Disney: Hollywood's Dark Prince, A Biography , Deutsch, 1995. Finch, Christopher, The Art of Walt Disney: From Mickey Mouse to the Magic Kingdom , New York, 1995. Bell, Elizabeth, Lynda Haas, and Laura Sells, editors, From Mouse to Mermaid: The Politics of Film, Gender, and Culture , Bloomington, Indiana, 1995. Cole, Michael D. Walt Disney: Creator of Mickey Mouse , Springfield, NJ, 1996. Watts, Steven, The Magic Kingdom: Walt Disney and the American Way of Life , Boston, 1997. Sherman, Robert B., and Richard M. Sherman, Walt's Time: From Before to Beyond , Santa Clarita, California, 1998. "The Mechanized Mouse," in The Saturday Review of Literature (New York), 11 November 1933. Mann, Arthur, in Harper (New York), May 1934. Bragdon, Claude, "Straws in the Wind," in Scribner's Magazine (New York), July 1934. Boone, Andrew R., "A Famous Fairytale is Brought to the Screen as the Pioneer Feature Length Cartoon in Color," in Popular Science Monthly (New York), 1938. Jeanne, René, "Comment naquirent les dessins animés," in Revue des Deux Mondes (Paris), 15 March 1938. Moellenhoff, F., "Remarks on the Popularity of Mickey Mouse," in American Imago , (Detroit, Michigan) no. 3, 1940. Boone, R., "Mickey Mouse Goes Classical," in Popular Science Monthly (New York), January 1941. Ahl, Frances Norene, "Disney Techniques in Educational Film," in The Social Studies , December 1941. "Walt Disney: Great Teacher," in Fortune (New York), August 1942. "Mickey Mouse and Donald Duck Work for Victory," in Popular Science Monthly (New York), September 1942. Mosdell, D., "Film Review," in Canadian Forum , November 1946. Wallace, Irving, "Mickey Mouse and How He Grew," in Colliers (New York), 9 April 1949. "A Silver Anniversary for Walt and Mickey: Disney's Magic Wand Has Enriched the World with Birds, Beasts and Fairy Princesses," in Life (New York), 2 November 1953. "Disney Comes to Television," in Newsweek (New York), 12 April 1954. Fishwick, Marshall, "Aesop in Hollywood: The Man and the Mouse," in Saturday Review (New York), 10 July 1954. "Cinema: Father Goose—Walt Disney: To Enchanted Worlds on Electronic Wings," in Time (New York), 27 December 1954. McEvoy, J.P., "McEvoy in Disneyland: A Visit with the Wonderful Wizard of Filmdom," in Reader's Digest (Pleasantville, New York), February 1955. "A Wonderful World: Growing Impact of the Disney Art," in Newsweek (New York), 18 April 1955. Powell, Dilys, "Hayley Mills on the Pickford Path," in New York Times , 13 August 1961. Sadoul, Georges, "Sur le 'huitième art'," in Cahiers du Cinéma (Paris), June 1962. Special Disney issue of National Geographic (Washington, D.C.), August 1963. "The Wide World of Walt Disney," in Newsweek (New York), 31 December 1963. Whitaker, Frederic, "A Day with Disney," in American Artist (New York), September 1965. Aubriant, Michel, "Le vrai Walt Disney est mort il y a des années mais ne soyons pas injustes . . . ," in Paris Presse , 21 December 1966. Comolii, Jean-Louis, and Michel Delahaye, "Le Cinéma à l'expo de Montréal," in Cahiers du Cinéma (Paris), April 1967. "Disney without Walt . . . Is Like a Fine Car without an Engine. Will the Great Entertainment Company Find a New Creative Boss? Or Will It Slowly Lose Momentum?," in Forbes (New York), 1 July 1967. Tucker, N., "Who's Afraid of Walt Disney," in New Society , no.11, 1968. Gessner, Robert, "Letters to the Editor: Class in Fantasia ," in The Nation (New York), 30 November 1970. "The Ten Greatest Men of American Business—As You Picked Them," in Nation's Business , March 1971. Pérez, F., "Walt Disney, una pedagogía reaccionaria," in Cine Cubano (Havana), no. 81–83, 1973. Murray, J.C., "Lest We Forget," in Lumiere (Melbourne), November 1973. Stuart, A., "Decay of an American Dream," in Films and Filming (London), November 1973. Special Disney issue of Kosmorama (Copenhagen), November 1973. Canemaker, J., "A Visit to the Walt Disney Studio," in Filmmakers Newsletter (Ward Hill, Massachusetts), January 1974. Sklar, Robert, in Movie Made America: A Social History of American Movies , New York, 1975. Rosenbaum, Jonathan, "Dream Masters," in Film Comment (New York), January-February 1975. Smith, D.R., "Ben Sharpsteen . . . 33 Years with Disney," in Millimeter (New York), April 1975. Beckerman, H., "Animation Kit: Movies, Myth and Us," in Filmmakers Newsletter (Ward Hill, Massachusetts), September 1975. Brody, M., "The Wonderful World of Disney: Its Psychological Appeal," in American Imago (Detroit, Michigan), no. 4, 1976. "Disney Night at the A.S.C.," in American Cinematographer (Los Angeles), February 1977. Paul, W., "Art, Music, Nature and Walt Disney," in Movie (London), Spring 1977. Schupp, P., "Mickey a cinquante ans," in Sequences (Montreal), January 1979. Canemaker, J., "Disney Animation: History and Technique," in Film News (NewYork), January-February 1979. Hulett, S., "A Star Is Drawn," in Film Comment (New York), January-February 1979. Canemaker, J., "Disney Design: 1928–1979," in Millimeter (New York), February 1979. Barrier, M., "'Building a Better Mouse': Fifty Years of Disney Animation," in Funnyworld (New York), Summer 1979. Smith, D.R., "Disney Before Burbank: The Kingswell and Hyperion Studios," in Funnyworld (New York), Summer 1979. Cawley, J., Jr., "Disney Out-Foxed: The Tale of Reynard at the Disney Studio," in American Classic Screen (Shawnee Mission, Kansas), July-August 1979. "Journals: Tom Allen from New York," in Film Comment (New York), September-October 1981. Griffithiana (Gemona, Italy), no. 34, December 1988. Kosmorama (Copenhagen), vol. 35, no. 188, Summer 1989. Animatrix , no. 6, 1990/1992. Cineforum , no. 319, 1992. Plateau , no. 2, 1993. The South Atlantic Quarterly , no. 1, 1993. New York Times , 6 May 1993. New York Times , 8 May 1993. Positif , no. 388, June 1993. New York Times , 13 July 1993. New York Times , 18 July 1993. Newsweek , 26 July 1993. Before Walt Disney, there was Emile Cohl (the "first animator," who made over 250 films in the early years of the twentieth century); Winsor McCay (whose Gertie the Dinosaur, created in 1914, was the original animated personality); John Randolph Bray (the Henry Ford of animation, whose technological and organizational contributions revolutionized the art form); and Otto Messmer, inventor of Felix the Cat, the Charlie Chaplin of animated characters and the most popular cartoon creation of the 1920s, entertaining audiences before Mickey Mouse ever uttered a squeak. So why is Walt Disney synonymous with animation? How could Fantasia , Snow White and the Seven Dwarfs , and Bambi have been re-released to theaters every few years and then marketed to home video, to delight generations of children? Simply because no other animator ever duplicated the Disney studio's appealingly lifelike cartoon characters and wonderful flair for storytelling. First, Disney was an innovator, a perfectionist who was forever attempting to improve his product and explore the medium to its fullest potential. 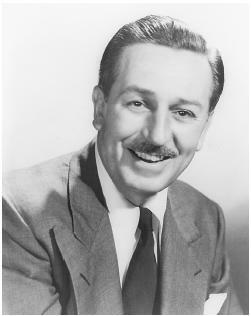 He was the first to utilize sound in animation, in Steamboat Willie , which was the third Mickey Mouse cartoon. The soundtrack here is more than just a gimmick: for example, in an animal concert, a cow's udder is played like a bagpipe and its teeth are transformed into a xylophone. The musical accompaniment thus emerges from the background, becoming an integral element in the film's structure. In Flowers and Trees , Disney was the first to utilize three-strip Technicolor in animation, a process devised by Joseph Arthur Ball: three different negatives, each recording a primary color, replaced the single camera film previously used. Snow White and the Seven Dwarfs was the first full-length cartoon feature: during the production, Disney staffers developed the multiplane method of realistically creating the illusion of perspective and depth. The camera, operated by several technicians, filled an entire room. A sequence was drawn and painted on several panes of glass, with each one carefully placed and rigidly held down. Cels of the animated characters were placed on the various planes, which would then be moved past the camera at varying speeds. Those close to the camera would go by rapidly; those in the rear would be moved more slowly. Just as significantly, however, Disney was a master organizer and administrator. As a result, from the 1930s on, the Disney Studio practically monopolized the animation industry. He established an industrialized assembly line, employing hundreds of animators and technicians who regularly churned out high-quality, Academy Award-caliber product. In the early 1930s, he opened distribution offices in London and Paris. He instigated large merchandising campaigns to reap additional profits via T-shirts, toys, and watches. Today, Disneyland and Disneyworld are living monuments to his memory. And it is not surprising that Disney eventually stretched his talents beyond pure animation, first combining cartoons with actors and, finally, producing live-action features, wildlife documentaries, and television series. In 1950, he produced Treasure Island , his first non-animated feature. In 1953, he made his first nature documentary, The Living Desert. The following year, he premiered his weekly television anthology series, which aired for decades. And he established the Buena Vista company as a distribution outlet for his films. Yet Walt Disney's ultimate legacy remains his animated stories, and the narrative elements which lifted them above his competition. His characters are not just caricatures who insult each other, bash each other with baseball bats, or push each other off cliffs. They are lifelike, three-dimensional creatures with personalities all their own: they are simple, but never simplistic, and rarely, if ever, fail to thoroughly involve the viewer. It is virtually impossible to rank the best of Disney's animated features in order of quality or popularity. Snow White , with its enchanting storyline and sweet humor, remains a joy for audiences many decades after its release. It is the perfect romantic fairy tale, with Snow White and her Prince Charming in a happy-ever-after ending, the comic relief of the lovable dwarfs, and the villainy of the evil Queen. The film's financial history is typical of most Disney features: originally budgeted at $250,000, it eventually cost $1,700,000 to produce. It earned $4.2 million in the United States and Canada alone when first released; by the mid-1990s, it had grossed over $175-million. Jiminy Cricket singing "When You Wish Upon a Star" is the highlight of Pinocchio . Bambi is easily the most delicate of all Disney features. And there is Fantasia , a series of animated sequences set to musical classics conducted by Leopold Stokowski and performed by the Philadelphia Orchestra: Tchaikovsky's The Nutcracker Suite , Dukas's The Sorcerer's Apprentice , Stravinsky's The Rite of Spring , and Beethoven's Symphony No.6 in F Major , among others. Fantasia is ambitious, innovative, controversial—how dare anyone attempt to visually interpret music?—and, ultimately, timeless. Since Disney's death in 1966, his studio has had its failures and triumphs. After a dry spell in the late 1960s and 1970s, it established a subsidiary, Touchstone Pictures, which successfully debuted in 1984 with the PG-rated Splash. In the intervening years, the studio struck deals with the likes of Bob and Harvey Weinstein of Miramax Films and Merchant-Ivory Productions, and marketed such traditionally un-Disney-like fare as Pulp Fiction, Kids, Pretty Woman , and The Hand That Rocks the Cradle. But the studio remains mostly synonymous with animation. In the 1990s, it produced a string of animated features which ranks with its classics of decades past: The Lion King, Pocahontas, Beauty and the Beast, and Aladdin. As of 1996, The Lion King rated number five on Variety's list of all-time money-earning champs, taking in over $312 million. Also ranked in the top 50 were other animated and non-animated Disney fare, which certifies the studio's status as a major Hollywood player: Aladdin (number 16, $217-million); Toy Story (number 24, $182 million); Pretty Woman (number 26, $178 million); the previously mentioned Snow White (number 29); Three Men and a Baby (number 34, $167 million); Who Framed Roger Rabbit? (number 42, $154 million); Beauty and the Beast (number 49, $145 million); and The Santa Clause (number 50, $144 million). In 1991, Beauty and the Beast became the first animated film ever nominated for a Best Picture Academy Award. And in 1995 came Toy Story , a groundbreaking feature produced completely on computer. An essay on Walt Disney would be incomplete without a note on Mickey Mouse, the most famous of all Disney creations and one of the world's most identifiable and best-loved characters. Appropriately, Disney himself was the voice of Mickey, who was originally named Mortimer. The filmmaker himself best explained the popularity of his mouse: ". . . Mickey is so simple and uncomplicated, so easy to understand, that you can't help liking him." With pen, pencil, ink, and paint, Walt Disney created a unique, special world. Max and Dave Fleischer, Walter Lantz, Chuck Jones, and many others may all be great animators, but Disney is unarguably the most identifiable name in the art form.